After the whole berries were washed and the stems removed, I measured out a generous cup and quartered them. I put this cup of berries in a small saucepan over med-low heat and cooked them until they softened and released their juices. I mashed them with the tines of a fork (although a potato masher would work well) to help them cook down faster. After about 3-5 minutes of simmering, I strained the berries through a fine sieve into a measuring cup, really pressing to extract all of the strawberry juice. I added enough water to this juice to total 1 cup of liquid, then added it back to the now empty saucepan. I heated the juice over medium heat. I mixed the sugar, salt, and cornstarch together and slowly whisked it into the juice, making sure that no clumps formed. I cooked this glaze for several minutes until it was thickened and began to clear, then I removed it from the heat and let it cool while I assembled the rest of the pie. 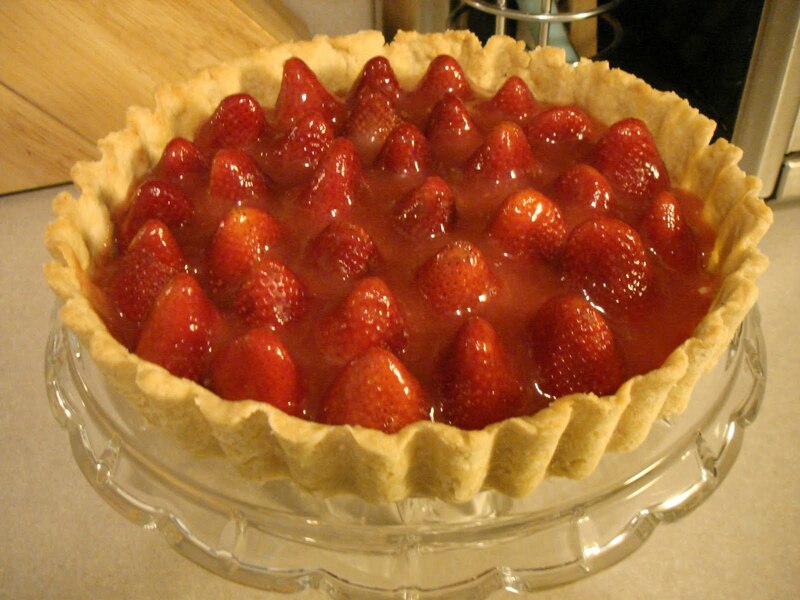 I placed the remaining whole berries, pointy tips up, in the cooled pie shell. 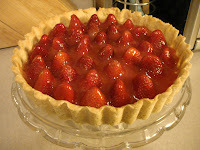 Then I spooned the glaze over the berries, making sure to coat each one. Once the shell was filled, the whole pie went into the refrigerator to chill. I was so happy with this recipe. 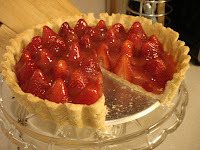 No gelatin, no jam, no food coloring -- just everday ingredients that I already had in my kitchen. 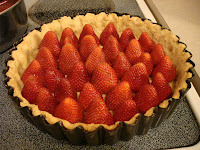 Note: you should use a really sharp knife to cut this pie so the berries are easily (and attractively) sliced. My one regret is that I didn't have any whipped cream to serve with this beautitul dessert. I'm sure that this recipe could easily be modified to accommodate any type of summer berry you happen to come across. I hope you will consider welcoming summer with a fruit pie of your own. Be creative and enjoy!